Jennifer Lopez Sells Mansion For 9.9 million dollars !! 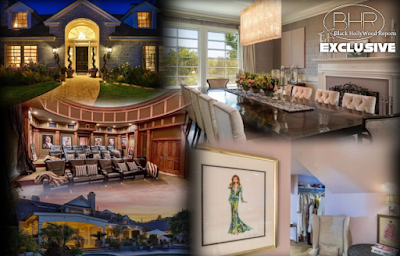 BHR Hollywood Reports............Jennifer Lopez can put the long, drawn out home sale process behind her now -- she just unloaded her Hidden Hills estate for $9.9 million. Sitting at 17,129 square feet, the sprawling residence boasts nine bedrooms and 12 bathrooms. Located inside a gated community, the extraordinary estate features a main house with formal living and dining rooms, massive gourmet kitchen that opens to an outdoor veranda, eight individual fireplaces, a wood-paneled library and a spacious master suite with its own sitting area and walk-in closet. Tailored to a multi-faceted artist like Lopez, the abode also has its own entertainment wing complete with its own professional bar, game room, dance studio, personal gym, recording studio, and a 20-seat theater. In fact, the in-home screening room is decorated with movie posters of the 47-year-old’s past films, including Selena, Monster-in-Law, and What to Expect When You’re Expecting. Other personal touches around the house include a sketch of Lopez wearing her famous Versace green dress to the 2000 Grammy Awards, which hangs in a dressing room filled with designer duds. Outside, a large resort pool and spa sits next to a rolling lawn overlooking the three acres of lush green grounds the mansion sits upon. The backyard has a children’s play area — built for 9-year-old twins Max and Emme, natch — surrounded by mature trees with direct access to horse-riding trails. Meanwhile, the front features a motor court leading to an eight-car garage.